ABSTRACT: The instrumental movements of Luigi Nono’s Il canto sospeso exhibit a variety of procedures that override determinations made by serial structures. The overrides, as I describe them, yield novel textures in multiple musical dimensions and seem to inspire Nono’s experimentation with electronic media later in his career. Further, multidimensional textures create formal musical and symbolic regions that underlie Nono’s projection of highly charged textual matter. Recent scholarship has loosely grouped these complex inter-dimensional relationships together under an umbrella term, “multidimensionality.” Large-scale multidimensionality shapes a 1960 piece for eight mixed voices, Sarà dolce tacere, and creates formal regions in a 1958 work for thirty-two mixed voices, Cori di Didone. (5) Both compositions, whose material is derived serially, achieve motion in various dimensions through imitation. For instance, in Sarà dolce tacere a particular durational value can echo throughout a passage of music, as can a single pitch (as opposed to a pitch-class) or a dynamic marking. Imitation also occurs in proportion (2:1 durations, for instance), taking inspiration from prolation canons. The echoes build threads in several dimensions. If the threads involve distinct performers, the threads intertwine in contrapuntal relationships analogous to contrary motion. Conversely, if echoes between threads occur within the same performers, the threads combine in a manner analogous to parallel motion. Sarà dolce tacere begins with densely skewed counterpoint and progresses gradually toward unison movement at its conclusion so that multidimensional textures give it shape, rather than serial transformations. Non è il canone alla Frescobaldi, o il canone rinascimentale, si tratta piuttosto di alcuni elementi che si compongono in modo canonico . . . che si mettono in circolo ma non necessariamente; non si tratta cioè dell’intervallo, della durata o del timbro . . . quello che faccio oggi a Friburgo con questo strumento che si chiama Halaphon è qualcosa di analogo. Tu dinamizzi nello spazio attraverso vari altoparlanti a velocità contrastanti un suono e questo suono poi si protrae girando in una direzione unica e in plurime direzioni. Lo stesso suono puoi farlo girare con altri quattro movimenti nello spazio: per esempio, con dinamiche differenti, con tempi differenti, acceleranti e ritardanti, oppure a salti . . . L’ascolto risulta estremamente complesso, ma la cosa piü straordinaria è che non hai bisogno di quattro segnali differenti, basta un unico segnale. The present paper arises from the hypothesis that Nono’s serial experiments provided inspiration for his electronic experiments, with multidimensional textures serving as prototypes for “il suono mobile.” The 1956 cantata Il canto sospeso exhibits a crucial stage of multidimensional development, making additional innovations in text-setting that provide a complementary façade for multidimensional textures. (8) As I shall discuss later, various re-ordering operations (as opposed to row transformations achieved through pitch-class transposition and inversion) create serial complexes whose elements are systematically consumed one by one to furnish attributes for a corresponding number of notes. (9) Thus, a typical twelve-element series plus its eleven order-position transformations would create an ordered complex of 144 elements, which would determine the pitch-classes, durations, or dynamics of exactly the same number of notes. I shall refer to the determinations made by such complexes generally and simply as “serial material.” By building its music note by note from such complexes, the composition illustrates serial origins of multidimensionality more visibly than Cori di Didone or Sarà dolce tacere, for instance. Pieces like these represent a stage at which Nono created multidimensional textures directly and do not use large serial complexes to supply content for every note in the composition. No. 2: I am dying for a world which will shine with light of such strength and beauty that my own sacrifice is nothing. Millions of men have died for this on the barricades and in war. I am dying for justice. Our ideas will triumph. No. 3: They are taking me to Kessariani for execution together with seven others. I am dying for freedom and for my homeland. Today they will shoot us. We die as men for our homeland. Be worthy of us. They are hanging me in the square because I am a patriot. Your son is leaving, he will not hear the freedom bells. No. 5: If the sky were paper, and all the seas of the world were ink, I could not describe my suffering and all that I see around me. I say goodbye to all of you and weep. No. 6: The doors open. Here are our murderers. Dressed in black. They drive us out of the Synagogue. How hard it is to say goodbye forever to life which is so beautiful! No. 7: Goodbye mother, your daughter, Liubka, is going into the moist earth. No. 9: I am not afraid of death. I will be calm and at peace facing the execution squad. Are those who have condemned us equally at peace? I go in the belief of a better life for [all of] you. The opening textual selection in No. 2 sets the stage thematically for the ensuing selections. No. 9 recapitulates No. 2’s themes, evoking a transcendent quality. Both Nos. 2 and 9 are set for choir, offering complicated vocal textures in line with their transcendent tone. (13) In contrast, No. 3 quotes three Greek citizens who provide frank, journalistic descriptions of the fates awaiting them. The remaining texts (Nos. 5, 6, and 7) evoke a third atmosphere, one of lament and departure. Beyond its textual matter, the composition has notable yet enigmatic features. The piece departs dramatically from Nono’s declamatory style in earlier works even though its textual matter (which bears uncanny resemblance to Survivor) begs for comprehension. The muddled textual delivery led Stockhausen to remark that the sonic content of the texts itself became subject to serial re-ordering, thereby creating a rift between phonetics and semantics. (14) Nono refuted Stockhausen’s (well-intended) observations, asserting that his music intertwined the phonetic and semantic aspects of its texts at historically profound levels. (15) In the debate Nono sheds all doubt that Sospeso’s texted movements preserved the letters’ meaning, but nowhere does he mention how the three instrumental movements (Nos. 1, 4, and 8) engage the piece’s textual content. (16) The analytical work of the present paper will focus on the instrumental interludes, and as will be seen, they make essential contributions to the piece’s overall artistic mission. Und auch mit dem Etikett seriell kann ich mich nur unter Vorbehalt einverstanden erklären. Ich schrieb schon damals nicht, was die Presse durchorganisierte Musik hieß. Ich arbeitete immer sozusagen in drei Stufen. Zuerst wählte ich das Material, das intervallische, das klangliche, das rhythmische. Dann experimentierte ich mit diesem Material, unterzog es vielleicht auch verschiedenen präedeterminierenden Prozessen, aber nur um zu sehen, im welcher Richtung es sich entwickeln könnte. Und dann komponierte ich, leitete also aus dem Material und den ihm einbeschriebenen Möglichkeiten eine ihm gemäße Form ab. Dabei war für mich das Komponieren nie bloß die Konkretisierung von vorgeformten Strukturen. Stets spielten improvisatorische Momente mit; ich hielt mir die Entscheidungen bis zum letzten Augenblick offen. Nono’s interventions arise in part to create multidimensional textures in Sospeso. Serial re-orderings, even when affecting several dimensions simultaneously, cannot produce multidimensional motion directly. Thus, Nono’s interventions, and lack thereof, will shape the discussion. I shall present two main, provisional types of intervention in the following pages. I shall also present various manifestations of these two categories that appear in Sospeso. I do not intend for the details offered here to be exhaustive, as other works contain further variants. In addition, I shall use the interactions among various musical dimensions as a framework to rework existing analyses and present new ones altogether of the three interludes. In this intervention type, a secondary system mediates the implementation of elements generated by a primary system, re-ordered row complexes in the case of Sospeso. The secondary system directly overrides determinations such as the ordering of pitch-classes or rhythmic values. The overrides are mechanized so that they affect large numbers of notes, much as primary systems generate material in large quantities. I refer to any intervention by secondary system as a “systemic override” to reflect the competition between systems, as well as the automated nature of the overrides. A near-ubiquitous systemic override in Nono’s music intervenes with the implementation of duration material. To illustrate how this is done, I shall use a system for notating rhythmic durations as fractional values. In this scheme, denominators (bottom values) represent the number of parts that divide a quarter note; for this reason they are called “beat-divisions.”(27) For instance, an eighth-note divides a quarter note into two parts; it would be assigned a denominator of 2. Similarly, an eighth-note triplet receives a denominator of 3, and so on. Numerators in this system represent factors given by serial systems, which beat-divisions then distort. For example, the duration factor 12 strongly bears the influence of the beat-division applied to it. Applied to a beat-division of 3, the resulting duration (12/3) has a length equal to four quarter-notes. Applied to a smaller beat-division such as 4, the resulting duration (12/4) results in a shorter length, three quarter-notes as opposed to four. Beat-divisions can also invert size-relationships between duration factors. A large factor can be applied to a small beat-division (12/6, equivalent to two quarter notes) and result in a shorter duration than a small factor applied to a large beat-division (5/2, equivalent to two-and-a-half quarter notes). In all, beat-divisions maximize the rhythmic variety afforded by a given base duration series. Serial order can compete with a second systemic override that uses rests to displace notes within chords. Rests of varying length create staggered entries rather than a unison, chordal attack. Values of rests preceding notes can be viewed in Box 1 and Box 2. Those rests have duration factors determined by the integer succession from 1 to 5. 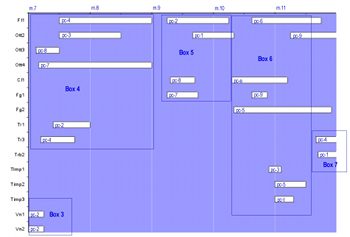 The succession maps onto pitch-class order through permutation, and Box 2 rotates the factors from Box 1. The placement of notes has a twofold effect. First, originally successive members of a pitch-class series become a single vertical configuration, obscuring serial order on one level. That verticality undergoes distortion by having its members displaced. Altering the arrangement of offsets between chords obscures serial order even more pervasively and unpredictably. A third systemic override multiplies serially-determined values by a proportional factor. 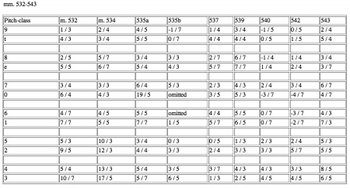 For instance, Table 1 contains the content for notes in measure 7 and measures 22–23 (not shown). In measure 7 the beat-division 5 is multiplied by 2 to create the proportionally smaller division 1/10. With a numerator of 11, the note cannot be reduced back to the original denominator. Likewise, measures 22–23 contain serial factors of double length (22 and 14) and doubly smaller beat-divisions. (30) While the values of these notes reduce mathematically to the original duration-factors and beat-divisions, the notes cannot be converted back to the original notation due to their metric placement. A rest of duration 5/6 precedes pc-t; the 5/6 rest cannot be converted to beat-division 3. Similarly, a rest of 1/6 duration precedes pc-2, and it also cannot be converted to beat-division 3. I have thus left the doubled values intact in Table 1. The multiplication reminisces of imitative procedures in augmentation and diminution canons, which reproduce material in proportional durations. Its use in Sospeso is not as pervasive as override by beat-division or rest-displacement, but it is worth mentioning in light of Nono’s fascination with puzzle canons. The second type of override has a more destructive effect on serial determinations, and not surprisingly, multidimensional textures find their most efficient realization through it. Override results from direct intervention, such as the outright alteration of a serial value. Box 2, for instance, contains an anomalous duration-factor of 9 in a region governed by duration-factor 10. The truncation appears to be inadvertent, but the alteration does serve a justifiable purpose. (31) By having the timpanist play the note as part of a decrescendo to the quietest dynamic value, Nono may have intentionally shortened the note to accommodate aftershocks from the percussionist’s cut-off. To reflect Nono’s direct manipulation of serial determinations, I shall refer to any intervention of this type as a “manual override.” Manual overrides defy neat categorization, appearing in numerous guises to befit the varied purposes they serve. In general, manual overrides intervene with the implementation of serial material, not its generation. For instance, Nono occasionally leaves out elements within a complex altogether or repeats them arbitrarily. At other times, he may interpret the same complex in multiple ways, or cease consuming it prematurely. More importantly, he may deliberately counteract an identifiable feature of a complex, and even override other overrides. In the end, Nono generally adheres to the possibilities presented by serial material, but he rarely refrains from intervening with it. The twelve collections form the basis for a network of nine 12 x 12 grids. 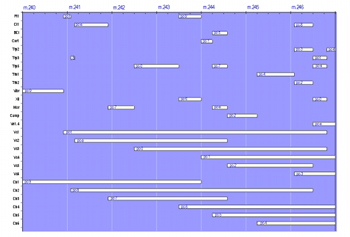 Example 2 shows the mapping out of time-points in these grids. (36) Each rank in the grids corresponds to a pitch-class in the series, and each column corresponds to a distinct time-point in musical space. In the system, pc-9 initially assumes time-point 1, pc-t assumes time-point 2, and so on. The twelve numerical collections control the timing of subsequent pitch-class entries. The second entry of pc-9, for instance, occurs after five empty time-points, then ten time-points, and so on. Following its own scheme, pc-t enters after ten empty time-points have passed, then eight, and so on. 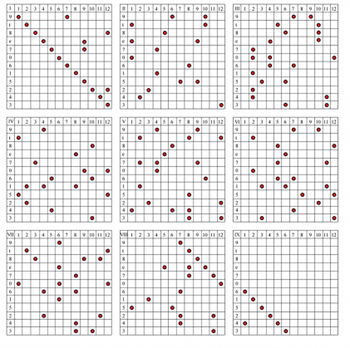 I shall refer to the configurations in Example 2 as “Position-Grids.”(37) Serial pitch-classes begin at Position-Grid I and end at Position-Grid IX in immediate succession because of the technique, which creates a constant value of 90 time-points for each pitch-class (empty spaces equal the sum of the integers 1 through 12, plus 12 for each pitch-class’s occurrence). The scheme also controls when pitch-classes have coincident attacks with others. For example, time-point 7 of Position-Grid I contains pc-9 and pc-6 together, while time-point 9 contains pcs-5, -7, and -e together. The position-grid system serves as a proto-score for No. 4, with pitch-classes rendered as pitches (i.e., without octave replications) whose registral placement projects the AIW’s signature shape. Through order-number multiplication No. 4 offers a novel, serial type of canon, in concept and realization. The self-replication inherent in the position-grids has an ancestry in types of imitation used by traditional canons. The connection is poignant because Nono and Bruno Maderna studied Flemish polyphony extensively. Several times Nono cites his studies at Venice’s Biblioteca Marciana and of his “games” solving puzzle canons in particular. In addition, Dallapiccola’s own canon-based music influenced him greatly. The grids activate all twelve pitches simultaneously to produce a twelve-voice canon, and the permutations ensure that each pitch has its own, distinct pattern of acceleration and deceleration between entries. The single rearrangement scheme creates continuity from one voice to the next, thereby providing the same type of cohesiveness afforded by strictly imitative repetition. In line with their canonic heritage, I propose the provisional term “permutation canon” for the position-grids’ inherently imitative structure. The position-grids map out two orchestral layers in No. 4, one for the strings and the other for the remainder of the instruments (Example 3). Durations in the non-strings follow values in Table 2 by columns—not by ranks—proceeding from bottom to top. Values are applied to time-points left to right so that the first twelve time-points possess duration-factors of 11, 2, 1, etc. The second column in the rearrangement scheme, read bottom to top (5 11 2 1 9 7 etc.) determines the durations of the next twelve time-points in the score, and so on. Material for two musical dimensions, pitch and duration, is thus plotted out for No. 4 in one sweeping, serial gesture. The unity of design accounts for the movement’s dynamics, which create a large-scale hairpin. The non-strings essentially follow a dynamics series (ppp, p, mp, mf, f, fff, fff, fff, f, mf, mp, p, ppp) that determines dynamics for each successive time-point within each pitch level in the position-grid system. Each pitch’s first appearance sounds at ppp, its second at p, and so on, with its three central appearances having the marking fff. At this point the dynamics reverse themselves in a gradual decrescendo. Shadowing notes in the strings echo the dynamics of the notes they connect; if the notes possess two different indications, the shadowing instrument makes a transition from the first to the second. While dynamic elements might appear to create multidimensionally oblique motion with durations and pitches, they actually form another serial component within the position-grids, thereby traveling in unison with pitch and durations. In contrast to their usual disruptive effect, beat-divisions articulate multidimensional unity even further by also forming a serial component of the position-grid system. The movement employs a single beat-division series (3, 4, 5, 7, 7, 5, 4, 3), which determines beat-divisions for each grid in the position-grid system, with Position-Grid IX appended to Position-Grid VIII. Beat-divisions gradually decrease in size for Grids I through IV. At the mid-point of the movement, beat-divisions increase in size so that all notes governed by Grids I and VIII/IX receive the beat-division 3, Grids II and VII receive beat-division 4, and so on. In a symmetric pattern, durations accelerate and decelerate proportionally (3:4:5:7), underscoring the movement’s hairpin dynamics. Extensive systemic overrides by rest-displacement and beat-division distort the serial order of pitch-classes without actually transforming the position-grids themselves. Example 4 shows measures 7–17 of No. 1 (measures 1–6 are shown by Example 1). Boxed areas may be clicked to summarize pitch-class, beat-division, rest-displacement, and dynamics content. Example 5 shows the content of the nine boxes as they correspond to the position-grid system. Nono appears to start the movement in strict observation of systemic beat-divisions and rest-displacements. Both systems undergo manual override by the end of the movement, whose content Table 3 shows. Pitch content from Position-Grid VII (see Example 2) is applied to only two beat-divisions at most within chords, with two beat-divisions undergoing diminution (6 and 8). Rest-displacement values are limited to the range 0 to 3 rather than 1 to 5, and their usage does not suggest a systematic permutation of their order. Nono thus assumes a substantial degree of freedom, as if to let the music evolve, quasi una fantasia, to this point. Manual override produces contrapuntal complexity between dimensions and creates fluctuations of speed within dimensions. For instance, Box 1 contains the first duration factor in the series (5) exclusively. 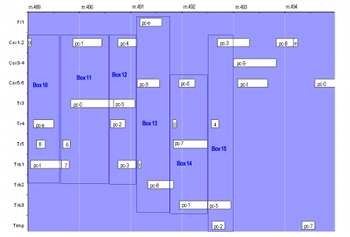 The content depicted by Box 2 follows in similar fashion as Box 1, with a single duration factor unifying the group. (42) Subsequent boxes are devoted to further members of the duration-factor series, with the pace speeding up (as in Boxes 3, 4, 6, and 9) and slowing down in turns (as in Boxes 5, 7, and 8). (43) In contrast, pitch-class material holds steadfast to changing with each successive time-point. Dynamics contribute added multidimensional density. In all, dynamics do not show the influence of any system analogous to those used for pitch-class placement and duration allotment. However, dynamic markings do occasionally mirror each other, such as mf-ppp and ppp-mf in Box 8 (measure 13). The content distribution also divides the movement into two large parts, coinciding with the juncture between the second and third traversals of the position-grid system. 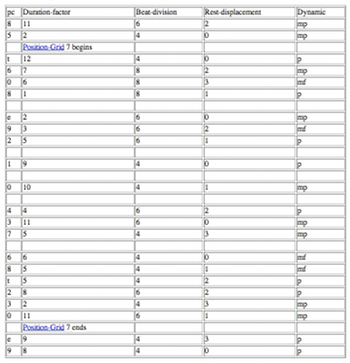 For the final two position-grid traversals, dynamics content is limited to single elements: ppp, p, mp, mf, f, fff. (44) The first two position-grid traversals use single elements except for fff, and pairs of elements arise in every conceivable combination (such as ppp-p or mp-mf). Because of the delayed entrance of fff until the third grid traversal, the second half of the movement achieves a generally louder dynamic than the first. The dynamics distribution also creates smaller formal regions, such as at Box 9 (measure 16), where all markings fall at the lowest levels (ppp and p). The rate of change for dynamics thus occurs at its own pace, sometimes unifying groups of notes (Boxes 3 and 9) or diversifying them (Boxes 1, 2, and 7). The movement implements the position-grid system roughly four times. Midway through the second implementation of Position-Grid V, duration material traverses values by columns in Table 2 rather than ranks. Duration material essentially remains fixed at this point, since the columns produce rotated versions of a single integer succession. During the final course of the position-grid system, many pitch-classes fail to appear, thereby accelerating the consumption of pitch material. Lastly, the final measures of the movement only reach what seems to be the end of Position-Grid VII (see Table 3), with pc-e and pc-9 appended at the conclusion. In this light, No. 1 concludes abruptly. No. 8 exhibits as extensive a level of override as No. 1, also yielding great multidimensional complexity. Like No. 1, it too has an underlying canonic structure that systemic and manual overrides distort and obscure. The movement’s duration factors undergo a procedure that produces the ten duration-factor collections shown by Table 4. (45) A recursively-applied rearrangement scheme reorders the collection from its outermost ordinal positions (working from right to left) to its center. (46) Complete duration material (notated as fractional values with duration-factors as numerators and beat-divisions as denominators) for No. 8 is shown by Table 5. (47) The resulting music uses only nine collections; a tenth collection, the integer succession 12 to 1, never makes its way into the music. Pitch-class material (i.e., the AIW) fuses itself to duration material to unify the two dimensions completely. At the tenth collection (after the first blank rank in the figure), individual ranks from Table 4 are applied in retrograde order from top to bottom. 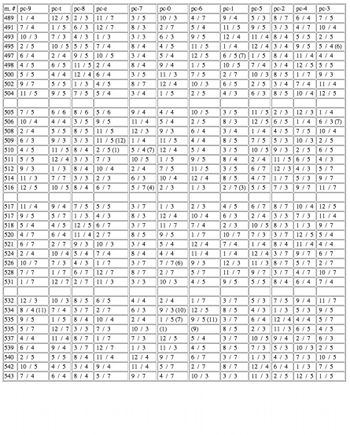 The final nineteen collections (after the second blank rank) form an exact retrograde of the preceding eighteen so that the thirty-six collections produce an overall palindrome. The music for No. 8, however, does not retain the symmetry of its serial material. First, Nono manually overrides serial values. Several individual durations (thirteen to be exact) do not match the rearrangement scheme. Of these, eight are very close (within one factor) to the scheme. The movement also omits two consecutive notes in the scheme from the second collection beginning at measure 535. Manual overrides exhibited here do not appear to contribute to multidimensional density, but their occurrence resonates with a spirit of extreme distortion in other realms. Beat-divisions distort the inherent symmetry of serial material even further. 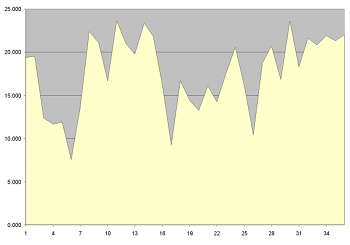 Example 7 shows the progress of duration material throughout the movement. 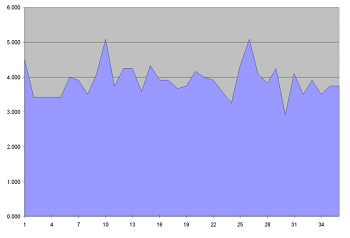 Peaks and valleys depict the average duration for each of the thirty-six collections; the vertical axis depicts notated durational values in terms of quarter-note lengths. Collection 26 (beginning within measure 528) features a dramatic dip in average duration because the smallest beat-division (1/7) remains active for the entire collection. The dip in Collection 26 does not find itself reflected in the movement, and thus the contour of the graph exhibits a noticeable asymmetric shape. Other dimensions enhance the through-composed nature of the movement. 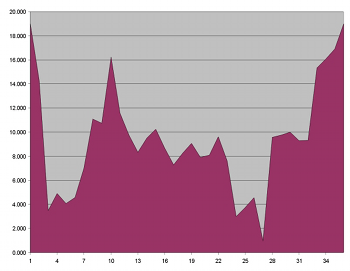 Example 8 shows the average dynamic range for each collection throughout the movement. The vertical axis depicts a linear scale of nineteen implemented dynamic indications, where 1=ppp and 19=fff. Intermediate values are ranked according to the loudest dynamic marking that is used; for example, the indication p-f is ranked below p-fff. As can be seen, several large-scale crescendi and decrescendi carve out an asymmetric pattern, although Collections 10 and 27 appear to invert each other. Octave placement also resists symmetry. Example 9 shows the average octave range for each collection (octave ranges correspond to ASA pitch designations; i.e., middle C begins Octave 4), again revealing an asymmetric pattern. 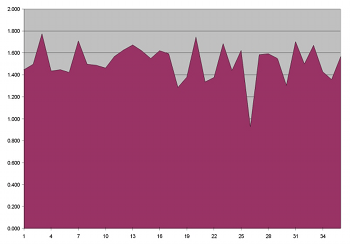 For instance, the dip in Collection 30 seems at odds with the peaks in Collections 10 and 26. Finally, instrumentation even seems to contribute to the global defiance of symmetry. In an effort to convey instrumentation as an average value, I have assigned the values 1 through 28 to each instrument in the orchestra, grouping them by family (i.e., winds, brass, and percussion; strings do not play in this movement). Example 10, whose vertical axis only ranges from 1 to 25, shows the average timbral value per serial collection. Wind instruments (flutes, oboes, clarinets, bassoons) hold the lowest values (1 through 11), horns occupy medium values (12 through 17), trumpets and trombones assume high values (18 through 26), and timpani possess the top values (27 and 28). A prevalence of one instrumental family will affect the average value. For instance, the deepest valleys in the figure mark sections devoid of or sparsely populated by brass instruments (Collections 6, 17, and 26). Similarly, a high average value signals the presence of many brass instruments (Collections 8, 11, 14, and 30). All told, the orchestration does not establish a symmetric, or even a recurrent, pattern. Further, individual dimensions do not synchronize with each other. The high degree of intervention forms a multidimensional texture based on fundamental, inner conflict. In their initial state, pitch and duration values exhibit inter-dimensional unity and symmetry. As in No. 1, secondary systems override primary material, and both primary and secondary systems become overridden during the course of the music. The movement also shows what effect Nono’s control over beat-divisions, dynamics, registral placement, and instrumentation have on distorting the serial palindrome in an environment of extreme manual override where even serial values themselves undergo alteration. The conflict, which a simple hearing of the piece does not reveal, plays a significant role for the piece as a whole. As mentioned previously, Nono did not discuss the instrumental interludes directly. However, works preceding and following Sospeso provide a meaningful context for its instrumental interludes. The second movement of Nono’s first published choral work, Epitaffio auf Federico García Lorca No. 1 (1952) is composed for flute and small orchestra, thereby not setting any words to music. Rather, textual verses appear at formal dividing points in the score so that only the performers know of their presence. The absorption prefigures the string quartet, Fragmente-Stille, an Diotima (1979–1980), whose Hölderlin fragments are printed in the score but not delivered. The stage work Prometeo, tragedia dell’ascolto (1984/1985) is based on Massimo Cacciari’s mixture of texts by Hölderlin, Aeschylus, Rilke, and others, many of which are never enunciated in performance. Boulez creates a similar effect during the “Commentaires” of Marteau sans Maître (1957), in which the texts are also not enunciated. All of these compositions have ample precedent in previous centuries, such as Beethoven’s String Quartet Op. 135 or the symphonic poem repertoire, to name only a few examples. Sospeso’s instrumental interludes, as I hope to show, belong to the current of wordless music that projects textual content. The multidimensional textures of the interludes carry the brunt of their textual gesture. Implemented without substantive intervention, serial material would have generated three canonic interludes. However, pervasive systemic and manual overrides ensure that only No. 4 attains realization as an unimpeded permutation canon. The canon provides a crucial moment of silence at this position, a silence not only achieved by the absence of text and singers, but also by the complete unity of motion among the pitch, duration, and dynamics dimensions. That is, the lack of multidimensional counterpoint creates its own type of silence. (49) In terms of Sospeso’s large-scale multidimensional organization, the distorted textures and multidimensional complexity in Nos. 1 and 8 create somewhat noisy regions that frame an expanse of silence. Space does not permit me to explore the meaning of this gesture fully, but suffice it to say, No. 4’s canonic silence has significant bearing on the flow of textual ideas throughout the composition. No. 4 falls strategically between the matter-of-fact statements of No. 3’s textual matter and the departing laments initiated by the letters in No. 5. At first glance, No. 4’s silence might appear merely to exhort contemplation on the texts in Nos. 2 and 3 as a type of commentary reminiscent of a sacred cantata, but in light of its position at the work’s center, its meaning for the movements ahead should also be considered. Further, Nos. 1 and 8 serve parallel functions as preludes to the choral movements in Nos. 2 and 9, with the latter movement recapitulating the former’s textual ideas of transcendence. The formal layout of textual themes thus follows a five-part symmetrical scheme: prelude-chorus (Nos. 1–2), exposition (No. 3), silence (No. 4), lament (Nos. 5–7), prelude-chorus (Nos. 8–9). The music fills the scheme at varying speeds, much as the dynamics and duration material of No. 1 slowed and hastened during its course. For instance, the “lament” region of the scheme fills the space of three musical movements, while the “exposition” condenses its ideas into a single movement. In the end, the canonic implications of the scheme do not attain realization; Nono manually overrides its symmetry, which makes the pristine canon of No. 4 even more remarkable. Babbitt, Milton. 1961. “Set Structure as a Compositional Determinant,” Journal of Music Theory 5 (1961): 72–94. Babbitt, Milton. 1962. “Twelve-Tone Rhythmic Structure and the Electronic Medium,” Perspectives of New Music 1.1 (1962): 49–79. —————. 1962. “Twelve-Tone Rhythmic Structure and the Electronic Medium,” Perspectives of New Music 1.1 (1962): 49–79. Babbitt, Milton. 1973. “Since Schoenberg,” Perspectives of New Music 12.1 (Fall-WInter 1973): 3–28. —————. 1973. “Since Schoenberg,” Perspectives of New Music 12.1 (Fall-WInter 1973): 3–28. Bailey, Kathryn. 1992. “‘Work in Progress:’ Analysing Nono’s Il canto sospeso.” Music Analysis 11.2–3 (July-October 1992): 279–334. Batstone, Philip N. 1972. “Multiple Order Functions in Twelve-Tone Music,” Parts 1, 2, Perspectives of New Music 10.2 (Spring-Summer 1972): 60–71 and 11.1 (Fall-Winter 1972): 92–111. Borio, Gianmario. 1999. “Sull’interazione fra lo studio degli schizzi e l’analisi dell’opera.” In Gianmario Borio, Giovanni Morelli, and Veniero Rizzardi, eds., La nuova ricerca sull’opera di Luigi Nono (Florence: Leo Olschki), 1–21. Clough, John. 1980. “Diatonic Interval Sets and Transformational Structures,” Perspectives of New Music 18.1–2 (Autumn 1979-Summer 1980): 461–82. Flamm, Christoph. 1995. Preface to Luigi Nono’s Il canto sospeso (London: Eulenberg), iii–xviii. Guerrero, Jeannie Ma. 2003a. “Text-Setting Techniques in Luigi Nono’s Choral Works (1956–1960).” Harvard University: Ph.D. dissertation. Guerrero, Jeannie Ma. 2003b. “Multidimensional Counterpoint and Social Subversion in Luigi Nono’s Choral Works,” Theory & Practice 28 (2003): 1–26. —————. 2003b. “Multidimensional Counterpoint and Social Subversion in Luigi Nono’s Choral Works,” Theory & Practice 28 (2003): 1–26. Guerrero, Jeannie Ma. 2005. “Tintoretto, Nono, and Expanses of Silence.” Paper presented at the Dublin International Conference on Music Analysis (University College Dublin, Ireland). —————. 2005. “Tintoretto, Nono, and Expanses of Silence.” Paper presented at the Dublin International Conference on Music Analysis (University College Dublin, Ireland). Headlam, Dave. 1985. “The Derivation of Rows in Lulu,” Perspectives of New Music 24.1 (Autumn-Winter 1985): 198–233. —————. 1996. The Music of Alban Berg. New Haven: Yale University Press. Huber, Nicolaus A. 1981. “Luigi Nono: Il canto sospeso VIa, b,” Musik Konzept 20: 58–79. Kowalski, David. 1987. “The Construction and Use of Self-Deriving Arrays,” Perspectives of New Music 25.1–2 (1987): 286–361. Lettere di condonnati a morte della resistenza europea. Turin: Giulio Einaudi, 1954. Lewin, David. 1976. “On Partial Ordering,” Perspectives of New Musicc 14.2 and 15.1 (Spring-Summer/Fall-Winter 1976): 252–59. —————. 1976. “On Partial Ordering,” Perspectives of New Musicc 14.2 and 15.1 (Spring-Summer/Fall-Winter 1976): 252–59. Marvin, Elizabeth West. 1991. “The Perception of Rhythm in Non-Tonal Music: Rhythmic Contours in the Music of Edgard Varèse.” Music Theory Spectrum 13.1 (Spring 1991): 61–78. Mead, Andrew. 1988. “Some Implications of the Pitch Class/Order Number Isomorphism Inherent in the Twelve-Tone System: Part One,” Perspectives of New Music 26/2: 96–163. Mead, Andrew. 1989. “Some Implications of the Pitch-Class/Order-Number Isomorphism Inherent in the Twelve-Tone System Part Two: The Mallalieu Complex: Its Extensions and Related Rows,” Perspectives of New Music 27/1: 180–233. —————. 1989. “Some Implications of the Pitch-Class/Order-Number Isomorphism Inherent in the Twelve-Tone System Part Two: The Mallalieu Complex: Its Extensions and Related Rows,” Perspectives of New Music 27/1: 180–233. Mila, Massimo. 1975. “Nonos Weg-Zum ‘Canto Sospeso’.” In Jürg Stenzl, ed., Luigi Nono: Texte, Studien über seine Musik (Zürich: Atlantis Musikbuch-Verlag), 380–393. Morris, Robert. 1977. “On the Generation of Multiple-Order-Function Twelve-Tone Rows,” Journal of Music Theory 21/2 (Autumn): 238–62. Morris, Robert. 1982. “Review: John Rahn, Basic Atonal Theory,” Music Theory Spectrum 4: 138–54. —————. 1982. “Review: John Rahn, Basic Atonal Theory,” Music Theory Spectrum 4: 138–54. Motz, Wolfgang. 1996. Konstruktion und Ausdruck: Analytische Betrachtungen zu ‘Il canto sospeso’ (1955/56) von Luigi Nono. Saarbrücken: PFAU-Verlag, 1996. Motz, Wolfgang. 1999. “Konstruktive Strenge und kompositorische Freiheit im ersten Satz des Canto Sospeso.” In Gianmario Borio, Giovanni Morelli, and Veniero Rizzardi, eds., La nuova ricerca sull’opera di Luigi Nono. (Florence: Olschki), 53–66. —————. 1999. “Konstruktive Strenge und kompositorische Freiheit im ersten Satz des Canto Sospeso.” In Gianmario Borio, Giovanni Morelli, and Veniero Rizzardi, eds., La nuova ricerca sull’opera di Luigi Nono. (Florence: Olschki), 53–66. Neidhöfer, Christoph. 2004. “Bruno Maderna’s Serial Arrays.” Paper presented at the annual meetings of the Music Theory Society of New York State (Rochester, NY) and the Society for Music Theory (Seattle, WA). Nono, Luigi. 1960. “Text-Musik-Gesang.” In Jürg Stenzl, ed., Luigi Nono: Texte, Studien über seine Musik (Zürich: Atlantis Musikbuch-Verlag, 1975), 41–60. Nono, Luigi. 1969. Interview by Hansjörg Pauli. In Jürg Stenzl, ed., Luigi Nono: Texte, Studien über seine Musik (Zürich: Atlantis Musikbuch-Verlag, 1975), 198–209. —————. 1969. Interview by Hansjörg Pauli. In Jürg Stenzl, ed., Luigi Nono: Texte, Studien über seine Musik (Zürich: Atlantis Musikbuch-Verlag, 1975), 198–209. Nono, Luigi. 1983. Handwritten notes for Guai ai gelidi mostri. In Angela Ida De Benedictis and Veniero Rizzardi, eds., Luigi Nono: Scritti e colloqui I. —————. 1983. Handwritten notes for Guai ai gelidi mostri. In Angela Ida De Benedictis and Veniero Rizzardi, eds., Luigi Nono: Scritti e colloqui I.
Nono, Luigi. 1984. “Verso Prometeo. Frammenti di diari.” In Angela Ida De Benedictis and Veniero Rizzardi, eds., Luigi Nono: Scritti e colloqui I: 385–96. —————. 1984. “Verso Prometeo. Frammenti di diari.” In Angela Ida De Benedictis and Veniero Rizzardi, eds., Luigi Nono: Scritti e colloqui I: 385–96. Nono, Luigi. 1987. “Un autobiografica dell’autore raccontata da Enzo Restagno.” In Angela Ida De Benedictis and Veniero Rizzardi, eds., Luigi Nono: Scritti e colloqui II (Lucca: Casa Ricordi, 2001), 477–568. —————. 1987. “Un autobiografica dell’autore raccontata da Enzo Restagno.” In Angela Ida De Benedictis and Veniero Rizzardi, eds., Luigi Nono: Scritti e colloqui II (Lucca: Casa Ricordi, 2001), 477–568. Schaller, Erika. 1996. Klang und Zahl: Luigi Nono—Serielles Komponieren zwischen 1955 und 1959. Bochum: Ruhr-U. Schönberg, Arnold. 1969. Letture, ed. E. Stein and L. Rognoni, transl. L. M. Rubino. Florence: La Nuova Italia. Starr, Daniel. 1984. “Derivation and Polyphony,” Perspectives of New Music 23.1 (Fall-Winter 1984): 180-257. —————. 1984. “Derivation and Polyphony,” Perspectives of New Music 23.1 (Fall-Winter 1984): 180-257. Starr, Daniel and Robert Morris. 1974. “The Structure of All-Interval Series,” Journal of Music Theory 18.2 (Autumn 1974): 364-389. Stockhausen, Karlheinz. 1958. “Sprache und Musik II,” Darmstädter Beiträge zur Neuen Musik 1 (1958). Reprinted in Texte zu eigenen Werken, zur Kunst Anderer, Aktuelles II (1952-1962) (Köln: DuMont Schauberg, 1964), 157-166. Stoianova, Ivanka. 1987. “Testo-musica-senso. ‘Il canto sospeso.’” In Restagno, Enzo, ed., Nono (Turin: Edizioni di Torino), 126-142. Westergaard, Peter. 1966. “Toward a Twelve-Tone Polyphony,” Perspectives of New Music 4.2 (Spring-Summer 1966): 90-112. 1. A useful comparison may be made between Nono’s re-ordering procedures, which I shall discuss here, and order-relations as explored by other composers: Milton Babbitt, “Set Structure as a Compositional Determinant,” Journal of Music Theory 5 (1961): 72–94, “Twelve-Tone Rhythmic Structure and the Electronic Medium,” Perspectives of New Music 1.1 (1962): 49–79, and “Since Schoenberg,” Perspectives of New Music 12.1 (Fall-Winter 1973): 3–28; Philip N. Batstone, “Multiple Order Functions in Twelve-Tone Music,” Parts 1, 2, Perspectives of New Music 10.2 (Spring-Summer 1972): 60–71 and Perspectives of New Music 11.1 (Fall-Winter 1972): 92–111; Dave Headlam, “The Derivation of Rows in Lulu,” Perspectives of New Music 24.1 (Autumn-Winter 1985): 198–233; David Kowalski, “The Construction and Use of Self-Deriving Arrays,” Perspectives of New Music 25.1–2 (1987): 286–361; David Lewin, “On Certain Techniques of Re-Ordering in Serial Music,” Journal of Music Theory 10.2 (Winter 1966): 276–287 and “On Partial Ordering,” Perspectives of New Music 14.2 and 15.1 (Spring-Summer/Fall-Winter 1976): 252–59; Andrew Mead, “Some Implications of the Pitch Class/Order Number Isomorphism Inherent in the Twelve-Tone System: Part One,” Perspectives of New Music 26.2 (Summer 1988): 96–163; Robert Morris, “On the Generation of Multiple-Order-Function Twelve-Tone Rows,” Journal of Music Theory 21.2 (Autumn 1977): 238–62 and “Review: John Rahn, Basic Atonal Theory,” Music Theory Spectrum 4 (1982): 135–54; Daniel Starr, “Sets, Invariance, and Partitions,” Journal of Music Theory 22 (1978): 1–42 and “Derivation and Polyphony,” Perspectives of New Music 23.1 (Fall-Winter 1984): 180–257; Peter Westergaard, “Toward a Twelve-Tone Polyphony,” Perspectives of New Music 4.2 (Spring-Summer 1966): 90–112. 2. Under Bruno Maderna’s guidance, Nono and Maderna transcribed many polyphonic works and studied historical treatises. A list of intended transcriptions can be found among the holdings in the Archivio Luigi Nono in Venice, ALN M02.01.06/8–35. Notes on treatises can be found in ALN M02.01.03/1–49. 3. Nono’s preoccupation with canonic symmetry is discussed in Erika Schaller, Klang und Zahl: Luigi Nono—Serielles Komponieren zwischen 1955 und 1959 (Ruhr-U. Bochum: Ph.D. dissertation, 1996). Canons and canonic devices populate Nono’s choral works, as discussed in Jeannie Ma. Guerrero, “Tintoretto, Nono, and Expanses of Silence,” paper presented at the Dublin International Conference on Music Analysis (University College Dublin, Ireland), 2005. 4. An extended discussion of multidimensional evolution in Nono’s choral music may be found in Jeannie Ma. Guerrero, “Text-Setting Techniques in Luigi Nono’s Choral Works (1956–1960)” (Harvard University: Ph.D. dissertation, 2003). 5. Jeannie Ma. Guerrero, “Multidimensional Counterpoint and Social Subversion in Luigi Nono’s Choral Works,” Theory & Practice 28 (2003), 1–26. 6. Luigi Nono, “Un autobiografica dell’autore raccontata da Enzo Restagno (1987),” in Angela Ida De Benedictis and Veniero Rizzardi, eds., Luigi Nono: Scritti e colloqui II (Lucca: Casa Ricordi, 2001), 489. All translations are the author’s unless otherwise noted. 7. Luigi Nono introduces the term in his handwritten notes for Guai ai gelidi mostri (1983), in Angela Ida De Benedictis and Veniero Rizzardi, eds., Luigi Nono: Scritti e colloqui I (Lucca: Casa Ricordi, 2001), 491–492. The term appears a year later in “Verso Prometeo. Frammenti di diari,” in Angela Ida De Benedictis and Veniero Rizzardi, eds., Luigi Nono: Scritti e colloqui I (Lucca: Casa Ricordi, 2001), 385–396. 9. For an examination of the various generative complexes used throughout Sospeso, see Kathryn Bailey, “‘Work in Progress’: Analysing Nono’s Il canto sospeso.” Music Analysis 11.2–3 (July-October 1992): 279–334. 10. Lettere di condonnati a morte della resistenza europea (Turin: Giulio Einaudi, 1954) was also reprinted in German as Und die Flamme soll euch nicht versengen (Zürich: Steinberg-Verlag, 1955). 11. Another socially engaged composition by Schoenberg, the Ode to Napolean, provided the musical basis for Nono’s first published work, Variazioni canoniche sulla serie dell’op. 41 di Arnold Schoenberg (1950). His first published choral work, the first of the three Epitaffios auf Federico García Lorca (1952–1954), sets poems by Federico García Lorca and Pablo Neruda that pertain to the Spanish Civil War (1936–1939). Like Survivor, the choir, soprano, and baritone soloists deliver texts as Sprechstimmen against a sparse texture in the orchestra. A traditional Spanish melody sung in unison concludes the third movement, also calling Survivor to mind. La Victoire de Guernica (1954) for mixed choir and orchestra also takes the Spanish Civil War as its subject, setting Paul Éluard’s verses and Picasso’s painting of the same title. While short textual phrases undergo polyphonic treatment that somewhat confuses their apprehension, longer textual phrases are delivered as Sprechstimmen, thus continuing the link to Schoenberg’s sound-world. Like the first Epitaffio, as well as Survivor, the piece ends with the choir singing in unison. 12. Luigi Nono, Il canto sospeso (Edition: Ernst Eulenberg, 1995), 90–91. 14. Karlheinz Stockhausen, “Sprache und Musik II,” Darmstädter Beiträge zur Neuen Musik 1 (1958). Reprinted in Texte zu eigenen Werken, zur Kunst Anderer, Aktuelles II (1952–1962) (Köln: DuMont Schauberg, 1964), 157–166. 15. Luigi Nono, “Text-Musik-Gesang (1960),” in Jürg Stenzl, ed., Luigi Nono: Texte, Studien über seine Musik (Zürich: Atlantis Musikbuch-Verlag, 1975), 41–60. 16. Nono’s commentary focuses predominantly on the work’s textual innovations, as in “Text-Musik-Gesang,” and letters between Nono and Eigel Kruttge revolve around the performance implications for the choir. Excerpts from these letters may be found in Flamm, v–vii. 17. Massimo Mila, “Nonos Weg-Zum ‘Canto Sospeso’,” in Jürg Stenzl, ed., Luigi Nono: Texte, Studien über seine Musik (Zürich: Atlantis Musikbuch-Verlag, 1975), 380–393. 19. I diverge from Bailey and others in matters of terminology. The twelve-tone series that generates Sospeso belongs to the class of “All-Interval Series,” as discussed by Daniel Starr and Robert Morris in “The Structure of All-Interval Series,” Journal of Music Theory 18.2 (Autumn 1974): 364–389. I shall refer to this series in my discussion by a more specific name, “All-Interval Wedge,” to distinguish it from other all-interval series. Nono uses an AIW beginning on pc-0 in the choral works La terra e la compagna (1957) and Cori di Didone (1958), as well as two instrumental works, Incontri (1955) and Canti per 13 (1955). The AIW appears throughout Sospeso, beginning on pc-9 instead. 20. Ivanka Stoianova, “Testo-musica-senso. ‘Il canto sospeso,’” in Restagno, Enzo, ed. Nono (Turin: Edizioni di Torino, 1987), 126–142. Stoianova argues that Nono’s processes are akin to the ‘exploration of intertextual space’ discussed in works of literary criticism, notably by Mikhail Bakhtin, Ferdinand de Saussure, and Claude Levi-Strauss. 21. Wolfgang Motz, Konstruktion und Ausdruck: Analytische Betrachtungen zu “Il Canto sospeso” (1955/56) von Luigi Nono, Saarbrücken: PFAU-Verlag, 1996; and “Konstruktive Strenge und kompositorische Freiheit im ersten Satz des Canto Sospeso,” in Gianmario Borio, Giovanni Morelli, and Veniero Rizzardi, eds., La nuova ricerca sull’opera di Luigi Nono (Florence: Olschki, 1999), 53–66. 22. Schaller, Klang und Zahl. 23. Nicolaus A. Huber, “Luigi Nono: Il canto sospeso VIa, b,” Musik Konzept 20 (1981): 58–79. 24. Gianmario Borio, “Sull’interazione fra lo studio degli schizzi e l’analisi dell’opera,” in Gianmario Borio, Giovanni Morelli, and Veniero Rizzardi, eds., La nuova ricerca sull’opera di Luigi Nono (Florence: Leo Olschki, 1999), 1–21. 25. Nono, “Un autobiografia,” 507. The Schoenberg reference cites a letter dated 27 July 1932 regarding String Quartet No. 3, Op. 30, and printed in Italian in Arnold Schönberg, Letture, ed. E. Stein and L. Rognoni, transl. L. M. Rubino (Florence: La Nuova Italia, 1969), 179–180. 26. Nono, Interview by Hansjörg Pauli, 23–24. 27. Elizabeth West Marvin employs the term and concept of “beat-division” in her examination of duration contours in “The Perception of Rhythm in Non-Tonal Music: Rhythmic Contours in the Music of Edgard Varèse.” Music Theory Spectrum 13.1 (Spring 1991): 61–78. 28. The duration-factor 5 leads a particular series based on the integer succession 1 to 12, as I shall show later. 29. The timpani’s pc-9 at measure 3 has a notated duration-factor of 9 rather than 10. I shall discuss this note more extensively later. 30. Again, duration factors are limited to the integers 1 through 12, so numbers larger than 12 arise secondarily. 31. The note appears in an earlier draft (ALN 14.13) and does not undergo further alteration in the published version. A similar truncation occurs in the bass clarinet at measure 497 (No. 8), where a serial duration-factor of 6 is truncated to 5 (a difference of 1/8 a quarter note) within a decrescendo. Another timpani note is truncated at measure 498 from duration-factor 7 to 6 (a difference of 1/10 a quarter note), this time serving a crescendo—here, concern for the timpani’s resonance still seems to motivate the shortening. There are in total thirteen alterations throughout No. 8 of which I am currently aware, without ruling out others that may be in the remaining movements. 32. “Cosmetic” permutation tables in dynamics, as she calls them, are not created by any self-replicating process that generates tables in other dimensions. As a smoking gun, the dynamics table for No. 9 appears to have been filled in one column at a time (thus without regard for the base series), whereas other tables are filled one rank at a time through the recursive re-ordering of the base series. 33. According to unpublished work by Borio and Veniero Rizzardi, cited by Borio in “Sull’interazione,” Nono and Bruno Maderna developed the technique in or around 1951. Nono first used it in his Composizione per orchestra and Maderna in his Improvvisazione No. 1. Borio also illustrates the technique’s implementation for the fourth movement of Il canto sospeso, but without the level of detail I provide here. Christoph Neidhöfer also provides a high level of detail concerning the technique’s use in several of Maderna’s compositions from the 1950s in “Bruno Maderna’s Serial Arrays,” paper presented at the 2004 meetings of the Music Theory Society of New York State (Rochester, NY) and the Society for Music Theory (Seattle, WA). 34. I shall use italicized numbers to denote ordinal positions in the hope of minimizing confusion between ordinal positions and values contained by these positions. I enumerate ordinal positions beginning with 1, as opposed to 0, to ease comparison with Bailey’s “permutation tables,” which employ the numbering from 1 to 12. More importantly, the enumeration at 1 matches that used by David Lewin in his explication of the multiplicative operation Mn in “On Certain Techniques of Re-Ordering in Serial Music,” Journal of Music Theory 10.2 (Winter 1966), 279. The rearrangement described here corresponds to Lewin’s M7. Dave Headlam shows Berg’s use of essentially the same rearrangement to derive the Acrobat’s row in “The Derivation of Rows in Lulu,” 214; and The Music of Alban Berg (New Haven: Yale University Press, 1996), 306. Headlam categorizes the rearrangement as an “extended rop-cycle,” where a “rop” is a “referential order position/pc pair” (“Derivation of Rows,” 203). Within the Mallalieu complex, columns contain rotations of an invariant numeric string, 2x mod 13, where x=0 to 11; horizontal ranks produce the strings 2xy mod 13, where y=1 to 12. That is, there is a 2-cycle in the second rank, a 4-cycle in the third, and so on until the last rank, which features a 2048-cycle. The vertical invariance arises because of the particular, and unique, way in which 2x and its multiples map out in mod 13, a prime-number modulus. While the prime-number modulus ensures that each of the twelve arithmetic series (i.e., the number cycles 1 to 12) yield all twelve factors without replication (incidentally, the prime-number modulus 7 assures the same for diatonic sets; John Clough makes this observation in “Diatonic Interval Sets and Transformational Structures,” Perspectives of New Music 18.1–2 (Autumn 1979-Summer 1980), 473. ), it does not guarantee the same results for all exponential series. In fact, only four exponential series (2x, 6x, 7x, and 11x) produce a twelve-member invariant string mod 13; it is the twelve-member string that guarantees the presence of invariant columns throughout the complex. The remaining exponential series produce shorter invariant strings, and thus when multiplied generate two or more distinct, invariant strings that are doled out into separate columns. The mappings change, as might be expected, with different prime-number moduli. I offer one last notable observation: 7x (which is generated by recursive M2) yields the retrograde of the vertical string produced by 2x (which is generated by recursive M7). Two distinct operations recursively produce the collections above. Lewin’s M2 operates on ordinal positions 1–6, and (order-inversion) I12(M2) operates on ordinal positions 7–12. The resulting invariant columns resemble those of the Mallalieu Complex except for two columns that bear the values 5 and 10 exclusively. Also, the 2x series reverses direction and breaks into fragments, as do the cycles in the horizontal ranks. A heterogeneously-derived complex such as this is not remarked upon in the Mallalieu literature and, admittedly, merits further investigation and formalization. 36. The diagram replicates information from Figura 1 in Borio, “Sull’interazione,” 16. 37. While Borio calls ranks in the arrangements by the term “Tondistanzreihen,” I prefer Motz’s more generic term “Positionreihe” and call the arrangements “Position-Grids” to reflect the interlocking between ranks and columns. 38. These time-points fall at Column 12 of Position-Grid IV and throughout Position-Grid V (measures 260–263). 39. The orchestration omits the piccolo, oboe, bassoon, timpani, Glockenspiel, celesta, and harp. 42. Again, noting the one exception in the timpani, whose duration-factor is 9 rather than 10. 43. The boxes correspond to the first three grids of the system. Further, Box 8 represents an overlap between the end of the first duration-factor series and the beginning of the second (i.e., 10 8 6, etc.). 44. The elements form the basis for the content of the entire cantata, so their presence might have some affinity with a direct statement of the AIW or an unimpeded application of duration factors. 45. The table coincides with the upper-left block of Figure 27 in Bailey, “Work in Progress,” 318. Bailey does not include the tenth collection. The permutation of ordinal positions is discussed above in Note 35. 46. As discussed in Note 35, two distinct order-number multiplications shuffle ordinal positions in No. 8. M2 operates on ordinal-positions 1 through 6, while I12(M2) operates on ordinal-positions 7 through 12. 47. The table adds beat-division information to Motz’s Beispiel 49 (“Konstrucktion und Ausdruck,” 126) and Bailey’s Figure 27 (“Work in Progress,” 318), which show only duration factors. 48. The overrides account for the high degree of distortion in Bailey’s Figure 27 towards the end of No. 8. 50. In Guerrero, “Tintoretto, Nono,” canons are shown to be consistently associated with silence and death in the choral works. It would appear that No. 4, and perhaps earlier canonic structures, belonged to a larger current in Nono’s compositional output. 51. Nono, Il canto sospeso, 89. A useful comparison may be made between Nono’s re-ordering procedures, which I shall discuss here, and order-relations as explored by other composers: Milton Babbitt, “Set Structure as a Compositional Determinant,” Journal of Music Theory 5 (1961): 72–94, “Twelve-Tone Rhythmic Structure and the Electronic Medium,” Perspectives of New Music 1.1 (1962): 49–79, and “Since Schoenberg,” Perspectives of New Music 12.1 (Fall-Winter 1973): 3–28; Philip N. Batstone, “Multiple Order Functions in Twelve-Tone Music,” Parts 1, 2, Perspectives of New Music 10.2 (Spring-Summer 1972): 60–71 and Perspectives of New Music 11.1 (Fall-Winter 1972): 92–111; Dave Headlam, “The Derivation of Rows in Lulu,” Perspectives of New Music 24.1 (Autumn-Winter 1985): 198–233; David Kowalski, “The Construction and Use of Self-Deriving Arrays,” Perspectives of New Music 25.1–2 (1987): 286–361; David Lewin, “On Certain Techniques of Re-Ordering in Serial Music,” Journal of Music Theory 10.2 (Winter 1966): 276–287 and “On Partial Ordering,” Perspectives of New Music 14.2 and 15.1 (Spring-Summer/Fall-Winter 1976): 252–59; Andrew Mead, “Some Implications of the Pitch Class/Order Number Isomorphism Inherent in the Twelve-Tone System: Part One,” Perspectives of New Music 26.2 (Summer 1988): 96–163; Robert Morris, “On the Generation of Multiple-Order-Function Twelve-Tone Rows,” Journal of Music Theory 21.2 (Autumn 1977): 238–62 and “Review: John Rahn, Basic Atonal Theory,” Music Theory Spectrum 4 (1982): 135–54; Daniel Starr, “Sets, Invariance, and Partitions,” Journal of Music Theory 22 (1978): 1–42 and “Derivation and Polyphony,” Perspectives of New Music 23.1 (Fall-Winter 1984): 180–257; Peter Westergaard, “Toward a Twelve-Tone Polyphony,” Perspectives of New Music 4.2 (Spring-Summer 1966): 90–112. Under Bruno Maderna’s guidance, Nono and Maderna transcribed many polyphonic works and studied historical treatises. A list of intended transcriptions can be found among the holdings in the Archivio Luigi Nono in Venice, ALN M02.01.06/8–35. Notes on treatises can be found in ALN M02.01.03/1–49. Nono’s preoccupation with canonic symmetry is discussed in Erika Schaller, Klang und Zahl: Luigi Nono—Serielles Komponieren zwischen 1955 und 1959 (Ruhr-U. Bochum: Ph.D. dissertation, 1996). Canons and canonic devices populate Nono’s choral works, as discussed in Jeannie Ma. Guerrero, “Tintoretto, Nono, and Expanses of Silence,” paper presented at the Dublin International Conference on Music Analysis (University College Dublin, Ireland), 2005. An extended discussion of multidimensional evolution in Nono’s choral music may be found in Jeannie Ma. Guerrero, “Text-Setting Techniques in Luigi Nono’s Choral Works (1956–1960)” (Harvard University: Ph.D. dissertation, 2003). Jeannie Ma. Guerrero, “Multidimensional Counterpoint and Social Subversion in Luigi Nono’s Choral Works,” Theory & Practice 28 (2003), 1–26. Luigi Nono, “Un autobiografica dell’autore raccontata da Enzo Restagno (1987),” in Angela Ida De Benedictis and Veniero Rizzardi, eds., Luigi Nono: Scritti e colloqui II (Lucca: Casa Ricordi, 2001), 489. All translations are the author’s unless otherwise noted. Luigi Nono introduces the term in his handwritten notes for Guai ai gelidi mostri (1983), in Angela Ida De Benedictis and Veniero Rizzardi, eds., Luigi Nono: Scritti e colloqui I (Lucca: Casa Ricordi, 2001), 491–492. The term appears a year later in “Verso Prometeo. Frammenti di diari,” in Angela Ida De Benedictis and Veniero Rizzardi, eds., Luigi Nono: Scritti e colloqui I (Lucca: Casa Ricordi, 2001), 385–396. For an examination of the various generative complexes used throughout Sospeso, see Kathryn Bailey, “‘Work in Progress’: Analysing Nono’s Il canto sospeso.” Music Analysis 11.2–3 (July-October 1992): 279–334. Lettere di condonnati a morte della resistenza europea (Turin: Giulio Einaudi, 1954) was also reprinted in German as Und die Flamme soll euch nicht versengen (Zürich: Steinberg-Verlag, 1955). Another socially engaged composition by Schoenberg, the Ode to Napolean, provided the musical basis for Nono’s first published work, Variazioni canoniche sulla serie dell’op. 41 di Arnold Schoenberg (1950). His first published choral work, the first of the three Epitaffios auf Federico García Lorca (1952–1954), sets poems by Federico García Lorca and Pablo Neruda that pertain to the Spanish Civil War (1936–1939). Like Survivor, the choir, soprano, and baritone soloists deliver texts as Sprechstimmen against a sparse texture in the orchestra. A traditional Spanish melody sung in unison concludes the third movement, also calling Survivor to mind. La Victoire de Guernica (1954) for mixed choir and orchestra also takes the Spanish Civil War as its subject, setting Paul Éluard’s verses and Picasso’s painting of the same title. While short textual phrases undergo polyphonic treatment that somewhat confuses their apprehension, longer textual phrases are delivered as Sprechstimmen, thus continuing the link to Schoenberg’s sound-world. Like the first Epitaffio, as well as Survivor, the piece ends with the choir singing in unison. Luigi Nono, Il canto sospeso (Edition: Ernst Eulenberg, 1995), 90–91. Karlheinz Stockhausen, “Sprache und Musik II,” Darmstädter Beiträge zur Neuen Musik 1 (1958). Reprinted in Texte zu eigenen Werken, zur Kunst Anderer, Aktuelles II (1952–1962) (Köln: DuMont Schauberg, 1964), 157–166. Luigi Nono, “Text-Musik-Gesang (1960),” in Jürg Stenzl, ed., Luigi Nono: Texte, Studien über seine Musik (Zürich: Atlantis Musikbuch-Verlag, 1975), 41–60. Nono’s commentary focuses predominantly on the work’s textual innovations, as in “Text-Musik-Gesang,” and letters between Nono and Eigel Kruttge revolve around the performance implications for the choir. Excerpts from these letters may be found in Flamm, v–vii. Massimo Mila, “Nonos Weg-Zum ‘Canto Sospeso’,” in Jürg Stenzl, ed., Luigi Nono: Texte, Studien über seine Musik (Zürich: Atlantis Musikbuch-Verlag, 1975), 380–393. I diverge from Bailey and others in matters of terminology. The twelve-tone series that generates Sospeso belongs to the class of “All-Interval Series,” as discussed by Daniel Starr and Robert Morris in “The Structure of All-Interval Series,” Journal of Music Theory 18.2 (Autumn 1974): 364–389. I shall refer to this series in my discussion by a more specific name, “All-Interval Wedge,” to distinguish it from other all-interval series. Nono uses an AIW beginning on pc-0 in the choral works La terra e la compagna (1957) and Cori di Didone (1958), as well as two instrumental works, Incontri (1955) and Canti per 13 (1955). The AIW appears throughout Sospeso, beginning on pc-9 instead. Ivanka Stoianova, “Testo-musica-senso. ‘Il canto sospeso,’” in Restagno, Enzo, ed. Nono (Turin: Edizioni di Torino, 1987), 126–142. Stoianova argues that Nono’s processes are akin to the ‘exploration of intertextual space’ discussed in works of literary criticism, notably by Mikhail Bakhtin, Ferdinand de Saussure, and Claude Levi-Strauss. Wolfgang Motz, Konstruktion und Ausdruck: Analytische Betrachtungen zu “Il Canto sospeso” (1955/56) von Luigi Nono, Saarbrücken: PFAU-Verlag, 1996; and “Konstruktive Strenge und kompositorische Freiheit im ersten Satz des Canto Sospeso,” in Gianmario Borio, Giovanni Morelli, and Veniero Rizzardi, eds., La nuova ricerca sull’opera di Luigi Nono (Florence: Olschki, 1999), 53–66. Nicolaus A. Huber, “Luigi Nono: Il canto sospeso VIa, b,” Musik Konzept 20 (1981): 58–79. Gianmario Borio, “Sull’interazione fra lo studio degli schizzi e l’analisi dell’opera,” in Gianmario Borio, Giovanni Morelli, and Veniero Rizzardi, eds., La nuova ricerca sull’opera di Luigi Nono (Florence: Leo Olschki, 1999), 1–21. Nono, “Un autobiografia,” 507. The Schoenberg reference cites a letter dated 27 July 1932 regarding String Quartet No. 3, Op. 30, and printed in Italian in Arnold Schönberg, Letture, ed. E. Stein and L. Rognoni, transl. L. M. Rubino (Florence: La Nuova Italia, 1969), 179–180. Nono, Interview by Hansjörg Pauli, 23–24. Elizabeth West Marvin employs the term and concept of “beat-division” in her examination of duration contours in “The Perception of Rhythm in Non-Tonal Music: Rhythmic Contours in the Music of Edgard Varèse.” Music Theory Spectrum 13.1 (Spring 1991): 61–78. The duration-factor 5 leads a particular series based on the integer succession 1 to 12, as I shall show later. The timpani’s pc-9 at measure 3 has a notated duration-factor of 9 rather than 10. I shall discuss this note more extensively later. Again, duration factors are limited to the integers 1 through 12, so numbers larger than 12 arise secondarily. The note appears in an earlier draft (ALN 14.13) and does not undergo further alteration in the published version. A similar truncation occurs in the bass clarinet at measure 497 (No. 8), where a serial duration-factor of 6 is truncated to 5 (a difference of 1/8 a quarter note) within a decrescendo. Another timpani note is truncated at measure 498 from duration-factor 7 to 6 (a difference of 1/10 a quarter note), this time serving a crescendo—here, concern for the timpani’s resonance still seems to motivate the shortening. There are in total thirteen alterations throughout No. 8 of which I am currently aware, without ruling out others that may be in the remaining movements. “Cosmetic” permutation tables in dynamics, as she calls them, are not created by any self-replicating process that generates tables in other dimensions. As a smoking gun, the dynamics table for No. 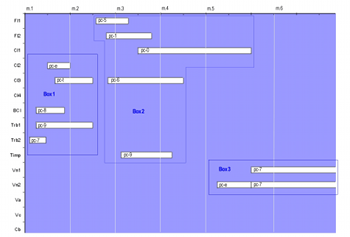 9 appears to have been filled in one column at a time (thus without regard for the base series), whereas other tables are filled one rank at a time through the recursive re-ordering of the base series. According to unpublished work by Borio and Veniero Rizzardi, cited by Borio in “Sull’interazione,” Nono and Bruno Maderna developed the technique in or around 1951. Nono first used it in his Composizione per orchestra and Maderna in his Improvvisazione No. 1. Borio also illustrates the technique’s implementation for the fourth movement of Il canto sospeso, but without the level of detail I provide here. Christoph Neidhöfer also provides a high level of detail concerning the technique’s use in several of Maderna’s compositions from the 1950s in “Bruno Maderna’s Serial Arrays,” paper presented at the 2004 meetings of the Music Theory Society of New York State (Rochester, NY) and the Society for Music Theory (Seattle, WA). I shall use italicized numbers to denote ordinal positions in the hope of minimizing confusion between ordinal positions and values contained by these positions. I enumerate ordinal positions beginning with 1, as opposed to 0, to ease comparison with Bailey’s “permutation tables,” which employ the numbering from 1 to 12. More importantly, the enumeration at 1 matches that used by David Lewin in his explication of the multiplicative operation Mn in “On Certain Techniques of Re-Ordering in Serial Music,” Journal of Music Theory 10.2 (Winter 1966), 279. The rearrangement described here corresponds to Lewin’s M7. Dave Headlam shows Berg’s use of essentially the same rearrangement to derive the Acrobat’s row in “The Derivation of Rows in Lulu,” 214; and The Music of Alban Berg (New Haven: Yale University Press, 1996), 306. Headlam categorizes the rearrangement as an “extended rop-cycle,” where a “rop” is a “referential order position/pc pair” (“Derivation of Rows,” 203). The diagram replicates information from Figura 1 in Borio, “Sull’interazione,” 16. While Borio calls ranks in the arrangements by the term “Tondistanzreihen,” I prefer Motz’s more generic term “Positionreihe” and call the arrangements “Position-Grids” to reflect the interlocking between ranks and columns. These time-points fall at Column 12 of Position-Grid IV and throughout Position-Grid V (measures 260–263). The orchestration omits the piccolo, oboe, bassoon, timpani, Glockenspiel, celesta, and harp. Again, noting the one exception in the timpani, whose duration-factor is 9 rather than 10. The boxes correspond to the first three grids of the system. Further, Box 8 represents an overlap between the end of the first duration-factor series and the beginning of the second (i.e., 10 8 6, etc.). The elements form the basis for the content of the entire cantata, so their presence might have some affinity with a direct statement of the AIW or an unimpeded application of duration factors. The table coincides with the upper-left block of Figure 27 in Bailey, “Work in Progress,” 318. Bailey does not include the tenth collection. The permutation of ordinal positions is discussed above in Note 35. As discussed in Note 35, two distinct order-number multiplications shuffle ordinal positions in No. 8. M2 operates on ordinal-positions 1 through 6, while I12(M2) operates on ordinal-positions 7 through 12. The table adds beat-division information to Motz’s Beispiel 49 (“Konstrucktion und Ausdruck,” 126) and Bailey’s Figure 27 (“Work in Progress,” 318), which show only duration factors. The overrides account for the high degree of distortion in Bailey’s Figure 27 towards the end of No. 8. In Guerrero, “Tintoretto, Nono,” canons are shown to be consistently associated with silence and death in the choral works. It would appear that No. 4, and perhaps earlier canonic structures, belonged to a larger current in Nono’s compositional output. Nono, Il canto sospeso, 89.